Britain’s Got Talent finalists The D-Day Darlings will perform classics from their album I’ll Remember You, such as The White Cliffs of Dover and Don’t Sit Under The Apple Tree, plus a specially created arrangement of the film’s iconic theme tune. The famous Triumph TR6 motorcycle, ridden by Steve McQueen in the dramatic fence-jump scene, will make a rare appearance on stage. Dan Snow will hear from veterans of the Second World War’s most daring escape and will explore the history and science behind the operation with renowned historian Paul Beaver and Dr Hugh Hunt of the University of Cambridge. Audiences will discover how Squadron Leader Roger ‘Big X’ Bushell’s ingenious plan inspired one of the most famous war films of all time. John Sturges’ dramatisation of the true story of a group of British, American and Canadian POWs who successfully escaped from Stalag Luft III in Upper Silesia in March 1944 is arguably the best World War II adventure film ever made. A host of big-name stars meshes beautifully in this meticulous recreation of the legendary escape. Although this is a film about courage, Sturges wisely takes a low-key approach, leavened with humour, rather than allowing the cast to indulge in macho antics. 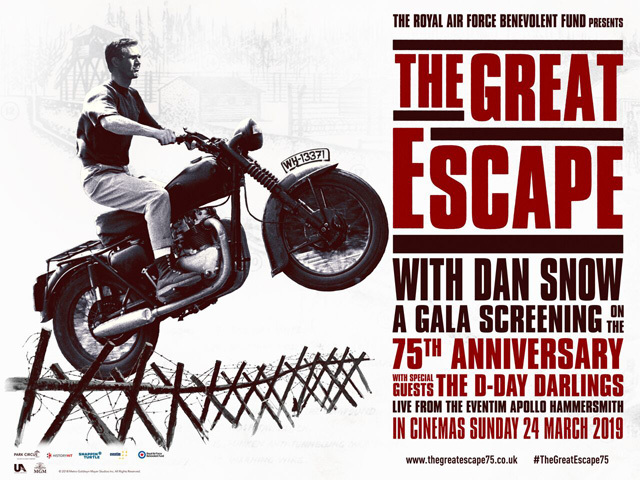 Saffron Screen is also delighted to have two authentic WW2 motorbikes on display outside the cinema and will be holding a collection for Essex Air Ambulance, after the film.